From one PA announcer to another, DCI's Dan Potter goes in depth with 2010 Hall of Fame inductee Brandt Crocker, who has been "The Voice" of Drum Corps International at its World Championship events since 1972. Potter learns about Crocker's start in the drum corps activity, who was inspirational in getting him involved, his most memorable moments in nearly 40 years behind the mic, and even about the announcing gaffes that he'd like to have as a do-over. 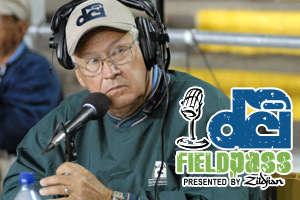 All this and more, as the 2010 season of Field Pass presented by Zildjian gets underway!